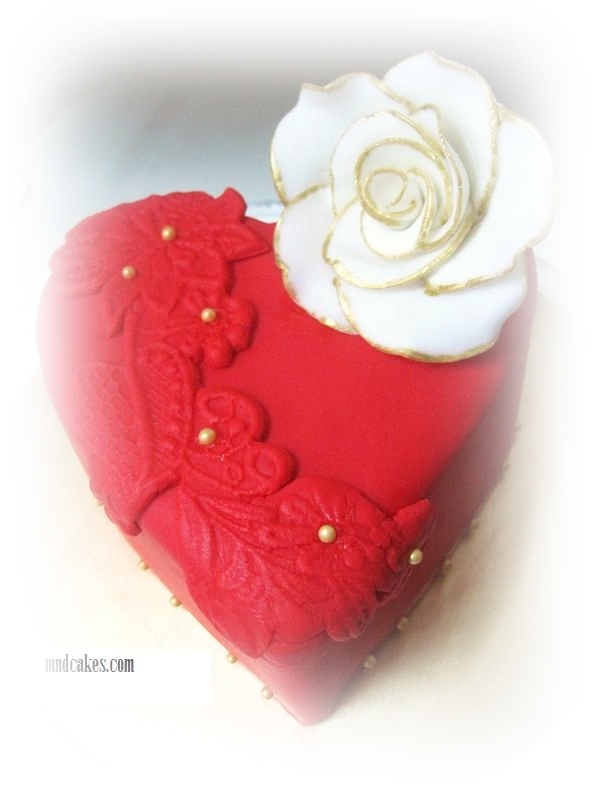 She loved my earlier heart shaped cake in green and red tiny leaves. So, she asked me to do something similar to her but in red and white themed colour. Though it's a small cake, it was not easy to make it looked elegant and gorgeous. The cake was meant for her wedding betrothal gift (hantaran cake). After a few nights of before-bed-thinking, suddenly an idea of red on red popping up. The rose has got to be white but something around it would be red. Yes, I made used of my lace mold made by Shahril of Cake Expression And Sugarcraft. It surely helped. To add some bling-bling effect on the cake, I decided to paint gold rings (with edible gold sheen) around the rose petals and also added a few gold dragees on the lace. I'm so pleased with the result. Hope the bride would like it too. How much would something like this cost? And I believe, it's fondant, right? The cake looks rather small. How many kg's is this? kindly email me or leave me your email, I shall quote you over the mail. Thanks.